Today, I have gathered the core development staff for the Nintendo 64 game The Legend of Zelda: Ocarina of Time , which was first released (in Japan) in November of 1998. Please introduce yourselves, telling us what you did back then. Okay. 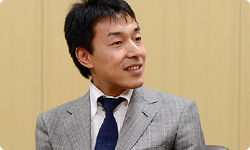 I’m Osawa from the Special-Planning & Development Department. When development of The Legend of Zelda: Ocarina of Time began, they called me in to the Entertainment Analysis & Development Division (EAD) and put me to work. This project had a lot of directors, but I was the oldest, so I was a sort of general director. About how many directors were there? Five altogether. I listened to each director’s opinion and coordinated them, saying, “Alright, alright, I get it. This is what we’ll do.” I also worked on the story and script. 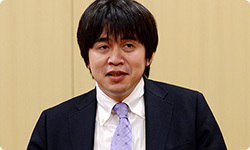 I’m Koizumi from the Tokyo Software Development Department. Recently, I’ve been making the Super Mario Galaxy series1 and Flipnote Studio2 in Tokyo, but when I try to remember when I was in Kyoto and making 3D action games one after the other - from Super Mario 643 to The Legend of Zelda: Ocarina of Time - I was working on so many different things that I can’t really remember what I did. 1Super Mario Galaxy series: A series of 3D action games released for the Wii console. Super Mario Galaxy was released in Japan in November 2007, and Super Mario Galaxy 2 was released in Japan in May 2010. 2Flipnote Studio: Free Nintendo DSiWare released for download beginning December 2008 in Japan. It allows users to create hand-drawn images with the stylus. Users can play multiple pages successively, resulting in flipbook animation. 3Super Mario 64: The first 3D action game in the Super Mario Bros. series. Released simultaneously with the Nintendo 64 system in Japan in June 1996. You were involved in so many things that you can’t sum them up. Right. I was involved with environment construction for 3D games, camera design, making the player-character Link, making items, and a little with event-related matters. I’m Kawagoe from the Software Development & Design Department. I was originally in charge of camera programming for Super Mario 64, so they brought me in to The Legend of Zelda: Ocarina of Time project so I could make use of that know-how. At the time, you were in charge of camera programming? Yes. But SRD4, which Iwawaki-san belongs to, was in charge of camera programming for The Legend of Zelda: Ocarina of Time, so I participated as an advisor. However, Osawa-san’s script was starting to become huge, so lots of cut scenes were necessary. 4SRD Co., Ltd.: A company established in 1979 that contracts to develop video game software programs and develops and sells Computer Aided Design packages. The head office is in Osaka, and their Kyoto office is inside Nintendo headquarters. At first, you were an advisor, but suddenly you were in deep. Yes. I became involved in the development of a tool for making the cut scenes, and before I knew it, I was working on storyboards and in charge of the movie parts. Currently, you mainly lend your support whenever the need for a cut scene arises somewhere in-house and a request goes to you at the movie production group. Could we say that The Legend of Zelda: Ocarina of Time was the game that started your involvement in such work? Yes. The Legend of Zelda: Ocarina of Time was the first time I clearly operated as a member of movie production. So Osawa-san’s huge script changed your destiny. Looking back, The Legend of Zelda: Ocarina of Time was a project that determined the future work of a lot of people. That’s right. Several people were like that. 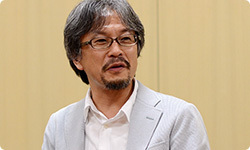 I’m Aonuma from EAD. I am producer of The Legend of Zelda: Ocarina of Time 3D and The Legend of Zelda: Skyward Sword5, which is still under development for the Wii console, but the first game in the series that I worked on was The Legend of Zelda: Ocarina of Time for the Nintendo 64 system. 5The Legend of Zelda: Skyward Sword: The newest title in the series. Scheduled for release in 2011 for the Wii console. Today, your name is always mentioned in the same breath as The Legend of Zelda, but before then, you did a variety of work. About the time you had just joined the company, we worked together. That’s right! (laughs) Unfortunately, though, the game we made together never made it out into the world. I spent a lot of time developing games with external companies. But I really wanted to develop inside Nintendo. I pestered Miyamoto-san about it and he said, “We don’t have enough people for The Legend of Zelda: Ocarina of Time, so come on in for a spell.” Of those of us here today, I joined the project last. You didn’t participate early on in development? No. When I joined, the script was somewhat established, and they were rapidly turning out the content. I designed a total of six early and mid-stage dungeons, most of the enemy characters, and enemy and boss battles. Oh, that’s right. Back then, anyone who could draw storyboards was drawing them. The boundaries between different jobs were vague back then. Most of the time, if you noticed something that needed to be done, you did it yourself. That’s right. I doubt many of the staff who were involved with The Legend of Zelda: Ocarina of Time - not just those of us here today - could say clearly where their work began and where it ended. Yeah! (laughs) I was surprised at the breadth of tasks I was involved in. Iwawaki-san, if you would, please? 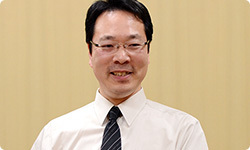 I’m Iwawaki in charge of main programming at SRD. Like Aonuma-san, The Legend of Zelda: Ocarina of Time was my first game in the series. What were you working on until then? I had been working on the Super Mario Bros. series for quite a while. 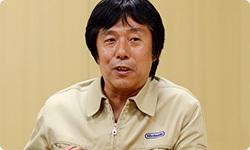 I had worked for some time with Koizumi-san on Super Mario 64, so that’s how I came to work on The Legend of Zelda: Ocarina of Time. For a long time, all we did was cause you trouble with the most impossible demands. You played an important role in realising all the ideas we came up with. That must have been hard. So not just the boss specs, but most of the demands that Aonuma-san came up with were irrational.